Fire activity on the Halstead Fire north of Stanley and the Mustang Complex Fire near Salmon is slowing down, though some closures and evacuation orders remain in effect. The 172,128-acre Halstead Fire reached 59 percent containment as of Thursday morning, with 117 personnel and two helicopters on scene. One Type I helicopter was used to fight spot fires in the area all day on Wednesday, while the one hand crew on the scene worked to mop up the area burned by the blaze near Marsh Creek. A Forest Service report stated on Thursday morning that the Collie Lake, Sawmill Creek and Pole Creek areas continued to burn, “but not aggressively.” Crews were expected to continue working in this area on Thursday, while a road grader continued to repair road damage along the Highway 21 corridor. Nip and Tuck Road, Forest Rd. 033, is open for non-motorized traffic only, while spurs leading to the area north of that road are still closed. Loon Creek Road, Forest Road 172, remains closed from 9 a.m. to 9 p.m. to allow for safe firefighting operations. The road is closed starting above Hecla Mine and continues to the Loon Creek Guard Station. The Forest Service reported on Thursday that repairs to roads damaged by fire suppression activities are 80 percent complete, but that the agency has not yet started rehabilitation of areas damaged by the fire itself. The Salmon River is closed to floating from Buckhorn Bridge to the Sawtooth National Recreation Area eastern boundary from Sept. 3- 22 due to salmon spawning. However, the Salmon-Challis National Forest reports that the Salmon River is open near the 332,301-acre Mustang Complex Fire. All picnic areas and campgrounds south of the Salmon River Road also are open. 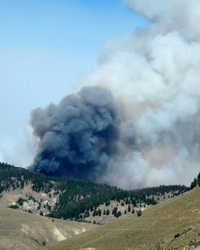 The Salmon-Challis National Forest reported that fire activity on Wednesday was mostly on the Montana portion of the fire and in the wilderness. The agency said that crews have begun removing equipment and supplies from the area as well as repairing damage from fire suppression efforts such as dozer containment lines. Residents in Sage Creek and along Highway 93 have had their evacuation order decreased from Level Two—meaning they could be evacuated at a moment’s notice—to Level One, meaning they should be ready to evacuate if conditions change. Highway 93 remains open, and the Forest Service reports that all businesses along that corridor are open as well. However, drivers should use headlights and reduce their speed along this road, due to fire traffic and smoky conditions. The Mustang Complex Fire remains only 20 percent contained, but fire behavior was still described as “minimal” on Thursday.